Today only these Wildhorn Outfitters Beach Towels and Blankets are just $15.99 (Reg. $27.99)! Huge but compact - At 63 sq. ft. it's over 20% bigger than other blankets. The integrated stuff sack with compression straps make it super portable and compact. The compressed pouch is only 6" x 7". Put all your beach gear on this with no problem. Quick Dry Parachute Nylon - Made from strong, durable, lightweight and breathable 100% parachute nylon, this blanket will withstand many years of use. Also, sand won't stick to your blanket. Just shake it off when you are done! Great for beach camping - a sand free experience! 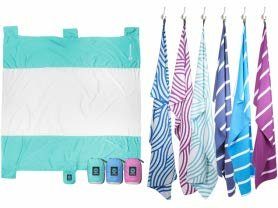 ABSORBENT - The Akumal microfiber beach towel holds 3-4 times its weight in water. This feature gives users the convenience of using the towel a lot in a short amount of time. COMPACT - At WildHorn Outfitters we believe in making it easy for everyone to experiences the outdoors. The Akumal microfiber beach towel is 10"x3.5" when stowed. And the thin character of microfiber is lightweight, easy to carry and space saving so you can spend more time and energy adventuring. Offer valid 8/11 only. Shipping is FREE for Amazon Prime Members or only $5 flat rate.